(Photos by Darren Andrew Weimert) Ed Mills, an associate professor of meat science, offers instruction on brining at the Penn State Meats Laboratory. The crew at the lab makes snack sticks. Local shoppers, whether they’re hungry home cooks just looking for a good steak or foodies on the hunt for fresh, specialty meat products, flock to one place Fridays in the spring and fall. It’s a long-standing institution on Penn State’s campus, tucked out of the way on Porter Road near the Centre County Penn State Visitor Center: the Penn State Meats Laboratory. Glenn Myers manages the 16,000-square-foot facility, built in 1958, where he not only oversees the production of the meat products available for purchase each Friday, but also helps groom the next generation of meat industry leaders. His relationship with the Meat Lab stretches back decades, to his own time as an undergraduate. He recounts that he found a job at the Meat Lab as a student at Penn State, working there all four years before leaving and working in the meat processing industry for the first five years of his career, then returning to Penn State. He’s coming up on 25 years at the facility. 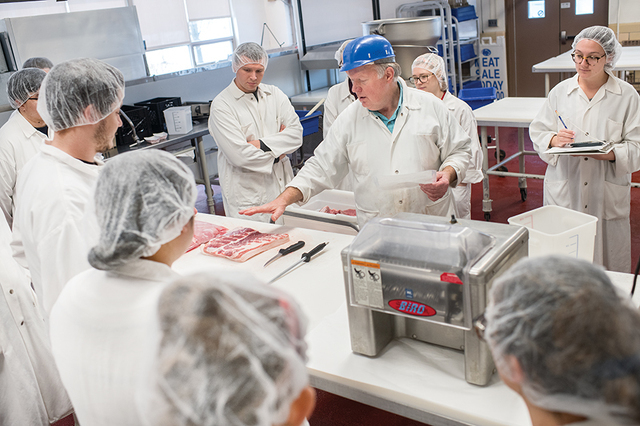 Myers explains the two aspects of the Meat Lab – education and sales – and how they work to the benefit of the other. The sales room is another learning opportunity for students. Each semester, Myers hires 10-12 students to work up to 20 hours per week in the facility’s production area. Some, he says, view the experience as just a college job, while others see it as an important stepping stone in their careers, an opportunity to learn in-demand skills. One of these students is Jeffrey Norris II. Originally from Bedford County, he grew up around livestock, working on his family’s hobby farm to raise sheep, goats, pigs, and cattle and showing livestock at county and national shows. After attending Penn State Altoona for two years, Norris transferred to University Park, where he now works at the Meat Lab. "The fact that Penn State has farms for each major livestock species and a meat lab is a truly once-in-a-lifetime experience that can be taken advantage of as a student at Penn State. There aren’t many other universities in the nation that have opportunities like these. Not only do the farms and the Meat Lab carry out everyday tasks that are necessary to raise food, but they also do research and testing to improve farming practices and continue to improve the agricultural industry,” he says. “I have been on the side of agricultural all of my life that sees only the raising and growing part of the animals. Now I get to see how cuts of meat like pork chops and T-bone steaks and products like snack sticks [and] summer sausage are made. This is a side of the agricultural industry that doesn’t see much attention from the younger generation, but is just as important as raising livestock,” he adds. After graduation, Norris hopes to become an engineer, designing or testing new and upcoming agricultural equipment. His peer Larry Eyre touts a similar background and experience. Growing up on an 800-acre grain farm in Northampton, Pennsylvania, he showed pigs and chickens in 4-H before coming to Penn State to major in animal science. He works at the Meat Lab processing animals from harvest to finished product and also with the weekly meat sales, with aspirations to work on a swine or poultry farm in live production after graduation. “No other university has all of these various farms to work on and allow students to get that experience. The skills that we gain from these facilities gives me and my fellow students an extra step when entering the workforce after graduation,” he says. Myers similarly notes the multitude of opportunities available to graduates who’ve worked in the Meat Lab, and the high wages available to them right after graduation. Those with working experience in the Meat Lab have an advantage over their peers, who may have simply stuck to general coursework, as they repetitively practice their skills to produce inventory for the weekly meat sale, versus learning to cut beef or pork in one class period before moving on to the next textbook subject. While the sales room gives students an opportunity to hone their craft, it also gives hungry locals a place to purchase fresh, quality meats and meat products that they’ll be hard-pressed to find elsewhere. The popularity of the sale is something Susan Darrin, a retired teacher who’s lived in Bellefonte for the last three years, can attest to. She says she tries to go to the Meat Lab at least twice monthly. "You have to get there early. ...They sell out fast. The lines get long, but neither snow nor rain will keep folks away,” Darrin says. Darrin likens the shopping experience to an old-fashioned butcher shop from decades past that she might have visited with her own parents to pick up the family’s weekly meats. She notes that the high quality and freshness of the products doesn’t necessarily lead to higher prices for Meat Lab customers, either. “I think the prices are very good, and lower,” she says, and “absolutely” recommends that locals check it out. The diversity of product is definitely one thing that keeps customers coming back. The Friday sale isn’t the only place to find these specialty products, however. In addition to selling summer sausage at the Berkey Creamery, the Meat Lab also distributes specially-created Italian dry salamis to local businesses, pairing with vendors to formulate recipes unique to their needs. For example, the Meat Lab produces salamis for not only two of the area wineries – Mount Nittany Vineyard and Winery and Happy Valley Vineyard and Winery – but also Good Intent Cidery in Bellefonte. Linda Weaver, the owner and general manager at Mount Nittany Vineyard and Winery, says her team was approached by Jonathan Campbell, meat extension specialist and assistant professor of animal science at Penn State, when he noticed the winery was selling salami made in Pittsburgh. Campbell and Myers visited the winery, met with the winemakers and began experimenting with various ingredients to create a salami recipe incorporating the brand’s Nittany Mountain Red. Happy Valley Vineyard and Winery offers two different salamis created with its wines, including a Genoa salami infused with its Noiret wine and another salami created using its Tempranillo. Adam Redding, owner of Good Intent Cidery, says his team always offered crackers and cheese in their tasting room, but “really thought having a local meat accompaniment would be great.” However, he was having a difficult time finding anything he liked that was local, high in quality, and with a high shelf life. One of his employees had taken a class at the Meat Lab and recalled that the Meat Lab produces dry salami. After a little experimentation, they came up with a recipe incorporating dry cider, unsweetened apple butter, and a special spice blend. The cidery has carried the salami for two years now and it’s been a huge hit with the cidery’s customer base. Whether out in the community or at the Meat Lab itself, it’s not uncommon for the facility’s products to sell out. “Steaks are one of the first things that disappears — New York strips, Delmonicos, filets. They’re kind of the hot item. We have limited quantities every week because we use only our own animals,” says Myers. The Meat Lab processes only around 35-50 head of beef cattle per year, 120-130 pigs, and approximately 40 lambs, and once the fresh product is gone, that’s it. To snag one of the prime cuts of steak for yourself, Myers recommends arriving at the Friday sale earlier rather than later and, as the weather warms up this spring, it’ll be harder to get your hands on these coveted cuts. Fall football weekends are also a busy time at the Meat Lab, as tailgaters and other fans stock up for game day.